Science and math explorations give your growing reader a chance to strengthen observation and writing skills by keeping a special journal to fill with sketches, notes, and graphs. Try these ideas to get your child started. Science and math explorations provide your growing reader with a chance to record all kinds of observations. Young children love to keep special journals, and fill them with all sorts of drawings, scribbles, sketches, notes, and graphs. Try to date each entry and watch as your child's observational and recording skills grow along with your child. Use any paper for the cover: cardstock, interesting cardboard and pretty greeting cards can all be used as a cover. Then, collect some twigs from the backyard and find a large, thick rubber band. Fold your cover in half. Fold your inside pages, and put them inside the cover. Trim as needed. Punch two holes with a hole punch, measuring down from the top and up from the bottom about 2 inches. Pull one end of the rubber band through the bottom hole and slide twig into the loop. Pull the other end of the rubber band through the top hole and slide the other end of twig through that. You now have a special journal into which your budding scientist can record observations. Begin using the science journal by taking your child outside. 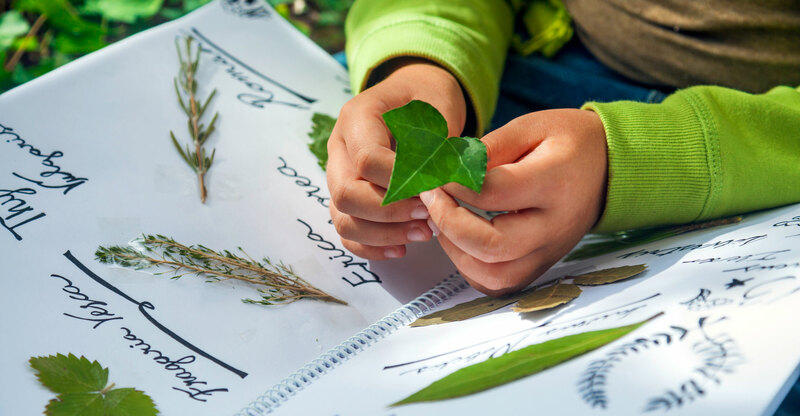 Encourage your child to write down what she observes about her surroundings, looking at both the big picture and the small, examining plants and rocks and insects up close. Have her make a record in their journal of what they experience with each of their senses. Then have her choose one animal or plant to watch for 10 minutes. Your child can choose anything: a dandelion, a grasshopper, a bird soaring overhead. Ask her to describe it as clearly as they can, as if she is writing for someone who's never seen that before. Have her watch for movements and take note of any sounds made. Ask your child to draw and label a picture of the plant or animal. Count the flowers in an area in the spring once a week for three weeks. Compare your tallies. Your child will have fun watching the numbers go up as flowers bloom in the spring. There are ants everywhere! Try following them to their home and see what they're up to. Where do they live? How many can you count in one place? Record these observations and your ant grand total. As parents know, dirt can be pretty interesting to kids. Have your child dig a hole and notice how the dirt changes as he digs deeper. Can he describe the different layers? What creatures did he find as he dug? Record these and other interesting findings in the journal. Use your notebook to make (or draw) a list of some common things and a few rare ones that can be found outside near your home or in a park. Include things like: acorn, pine cone, flat rock, bird feather, weed, flower. Hand your child the notebook and let the scavenger hunt begin! Special thanks to the Two Writing Teachers for their field journal directions, and Nature Rocks for the nature-based ideas for family fun. Download this article as a PDF document. View this article in Spanish. Find more resources in our Literacy in the Sciences section.